Winnery-Sage.com has categorized wine into a number of "types", like Red, White etc.. Many Wineries tend to specialize in one or two of these types. Unlike focusing on a specific region or country, a Winery may make almost exclusively Red Wines for instance. 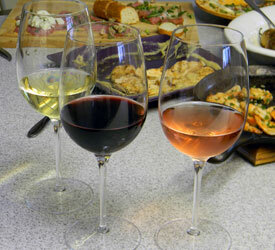 Others in cooler regions may focus more on White Wines so the typical product is very heavily influenced by the region where the Winery gets its grapes. The possible entries for this field are Red, White, Rose, Blend, Sparkling, Fortified, Blends (something like a Meritage/Bordeaux blend or a Rhone blend) or Mix, meaning there is no specific type of wine that is a specialty. To find any member Wineries that specialize in making specific types of wines, click below to visit our Winery Database and filter on the “Typical Product” field name to find Winery Tasting Rooms.